UW-Eau Claire through May 12. Twenty-three years ago, award-winning photographer and author John Noltner graduated from UW-Eau Claire with a degree in communication and journalism and a new-found love for photography. Now he is back on campus with a full-fledged exhibit that asks viewers to explore the meaning of peace and the commonalities that we as humans share. Noltner’s exhibit, A Peace of My Mind, features the portraits and personal reflections of more than 50 diverse subjects who discuss what peace means to them and how they work to cultivate it in their daily lives. Some of those profiled include a homeless man, a CEO, a Holocaust survivor, a Somali refugee, and a Buddhist financial planner. 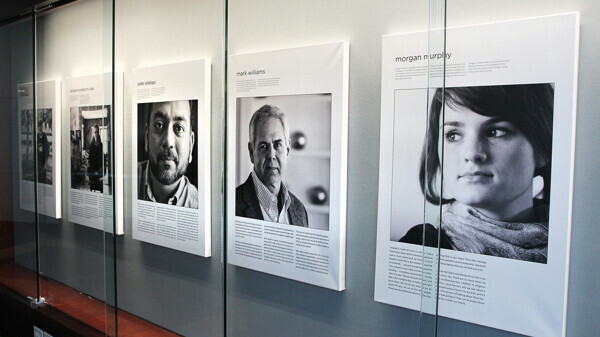 By documenting each person’s unique experience, Noltner hopes to foster a public dialogue about conflict resolution, tolerance and civic responsibility. Based in Minneapolis, Noltner has been a freelance photographer for nearly 20 years specializing in portrait, lifestyle, and travel photography. An ever-evolving project since its inception in 2009, A Peace of My Mind was reproduced as a traveling exhibit in 2010 and since then has been hosted by numerous colleges, libraries, and galleries across the country. In 2011, the project culminated in a book with a forward written by peace activist Ela Gandhi, the granddaughter of Mahatma Gandhi. It has received a gold medal in the Midwest Book Awards and a silver medal from the Independent Publishers Association. Rick Mickelson, photographer and program manager at UW-Eau Claire’s Learning and Technology Services, was excited to have orchestrated the exhibit. A fellow alumni and good friend of Noltner’s since “the old film days” of photography, Rick has been closely following Noltner’s growing career. Mickelson says it only felt natural for UW-Eau Claire to host Noltner’s work. Since December, Noltner has been collaborating with three UW-Eau Claire photography students who are in the process of replicating A Peace of My Mind in the Eau Claire community. The mentorship, combined with his son’s recent acceptance at UW-Eau Claire, has brought Noltner back to visit his old stomping grounds several times. Currently, Noltner is widening the scope of his project in anticipation of a second book that will include similar interviews with people throughout the United States. According to Noltner, the need for understanding exists in concentric circles and there is always opportunity to lend a hand, no matter the scale. John Noltner’s exhibit, A Peace of My Mind, is on display through May 12 at UW-Eau Claire in the Davies Center, Haas Fine Arts Center, McIntyre Library and Hibbard Humanities Hall. The exhibit will culminate in a May 7 lecture by Ela Gandhi at Schofield Auditorium as part of UWEC’s Forum series. For more information, visit www.apeaceofmymind.net.